Drum lampshades are very much back in style. These lampshades were popular up until approximately 30 years ago, when they fell out of favor. They are now enjoying a strong comeback among home decorators. Drum lampshades are a nice choice for almost any lamp in any room in a home. They provide interesting lighting, because the light from the lamp will be reflected upward toward the ceiling, out through the lampshade and down all at the same time. Learn how to make a drum lampshade and incorporate this interesting lampshade into your home decor. Determine the size of the drum lampshade you will make. The top and bottom rings should be the same diameter. 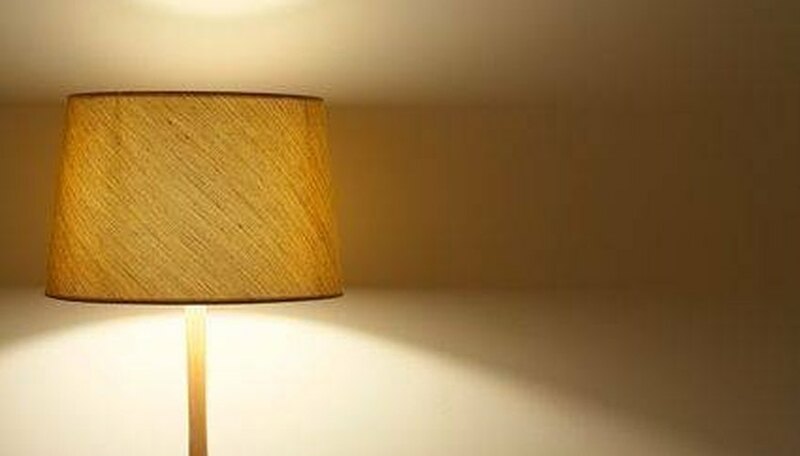 An example of a size you could make is a lampshade that is 9 1/2 inches high and has a top and bottom diameter of 18 inches. Lay out the fabric-covered styrene onto a flat work surface. Using the example given in Step 1, measure down from one long edge of the styrene 9 1/2 inches and measure across the entire long edge 58 inches. Make small marks with the pencil to create cutting lines to make a lampshade piece that is 58 inches long and 9 1/2 inches tall. Cut out the lampshade piece carefully with the scissors. Squeeze a line of glue along the entire top edge of the wrong side of the lampshade piece. Place the top ring in position on the edge of the lampshade piece along the line of glue. Wrap the lampshade piece around the top ring and hold it in place with clothespins as you wrap. Add a bit more glue when you reach your starting place and place another clothespin at this spot to secure it well. Turn the lampshade over and repeat Steps 4 and 5 to attach the bottom ring. Separate the vertical lampshade seam carefully and place a line of glue inside the edges. Press the seam together with your fingers until the seam has set enough that it won't move as it dries. Allow the lampshade to dry completely before continuing with embellishments. Glue grosgrain ribbon lengths onto the lampshade along the top and bottom edges. Begin applying a line of glue at the back seam bottom edge of the lampshade. Apply 2 or 3 inches of glue and then affix the length of ribbon. Continue in this fashion all the way around the bottom edge of the lampshade. Repeat with the top edge of the lampshade.